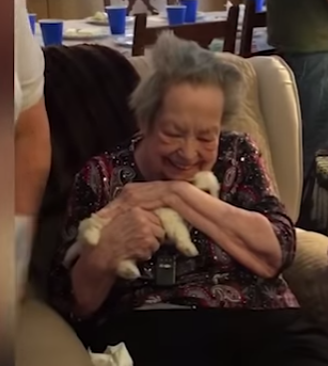 Twitter users enjoyed the touching moment a 96-year-old received a new puppy for her birthday. The moment came months after her previous service dog had died. Twitter user Ian Kellems shared footage of his great-grandmother’s first meeting with her new Maltipoo pup. Her reaction is sure to brighten anyone’s day. The video has been widely shared on the social media site and on YouTube. People loved Nadine's reaction to her new Maltipoo puppy. Ian says the affection his great-grandma showed hasn’t stopped since. “She absolutely loves the puppy." Ian’s great grandma, Nadine, owned a service dog for 12 years until it passed away recently. She was devastated after her previous seeing eye dog Abby passed away on August 1. She has been asking for a new one since. So, for her birthday her two daughters and grandchildren surprised her with a Maltipoo puppy. Nadine lives in West Valley, Utah, with her two daughters. "My great grandma clearly cannot fully care for a puppy, and that is why she lives with her two daughters who will be the primary caregivers and owners of the puppy." 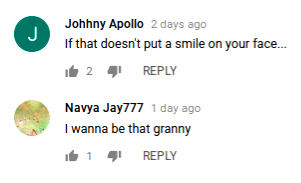 “My great grandma is a WWII vet and the sweetest woman alive and I just hope this video spreads some joy." A version of this article originally appeared on Press Association.